Before formal advocacy groups formed in Vancouver to push for better policies and conditions for transportation cycling, small groups of people would gather together to share their love of riding bicycles — for fun, exercise and companionship, and a little light competition. They were the first voices for change. In existence in the Greater Vancouver region since the 1970s, member-based clubs like the Richmond Bicycle Club, the Vancouver Bicycle Club, and the BC Randonneurs Cycling Club were relatively low in profile when compared to cycling advocacy groups today. These organizations were primarily focused on amateur racing and recreation, and club members tended to be confident cyclists; many adhered to the views of American cycling advocate John Forester, who was (and still is) vociferously in support of ‘vehicular cycling’ — riding alongside motor vehicles on city streets and provincial highways. But they were also concerned about road conditions impacting their members’ access to popular cycling routes, as well as general safety. In those early days, in that narrow ground between Forester’s ‘effective cycling’ and the desire for mainstream acceptance, the clubs led the charge for advocacy — asking local government, including BC Transit, for more favourable rules and facilities for accommodating cyclists. When I came to Vancouver, I sought out the Vancouver Bike Club. I went to one of their meetings, and they said, "Hi — and what position on our Board would you like?" More or less. So I got involved. I joined the Vancouver Bicycle Club and met Marion Orser. Most cyclists like myself are soloists. I just decided to join because at that particular time I wanted to meet like-minded people. In my personal life there weren't many people cycling. At the time, the Vancouver Bicycle Club was quite an activist group. When you went to the meetings there was often someone who got up and talked about education. Foresterian yes, but how you ride through certain situations. It was just a part of the group. Clubs advocating — that's a very old tradition. The cycle touring club in England gets people on the go, has events, produces maps, and is a reference point for millions of people who have toured Britain and so on. The City of Vancouver was just talking about bike lanes. “What are we going to do about cyclists?” That sort of thing. Daniel Egan is the first person I met who was a bicycle advocate. Dan was with the Safety Council, and he went to on to become the bicycle coordinator for the city of Toronto. He was the first one to start a mass bike ride in Vancouver. The City of Vancouver was on-side; it became the Pacific Populaire for the Randonneurs. The first act of advocacy that stuck with me was with Dan. We carried life-size cardboard bicycles onto the Seabus, because bicycles weren't allowed at the time. When we were challenged, we said they are objects of art, and we were allowed on with them. And that was the start of it all. It was the first little act of defiance in Vancouver, the first active activism that I remember being involved in — that you should allow cyclists on the Seabus. Those people were not paid; those were all people doing it out of the goodness of their heart. Bicycles were definitely seen as a pretty low priority — many people working at BC Transit were very operations-focused, very service-focused, but not thinking about broadening the customer base. It was just after the first section of the Expo SkyTrain Line opened, and it was all about efficiency. BC Transit needed to be enlightened. I worked on a lot of access issues as part of my career; there was a move at the time in the late eighties for the mainstream system to become more accessible. I was quite involved in planning and working on the program to help BC Transit purchase and install lifts into the buses, and then again as the technology evolved to the low floor buses of today. A lot of the work was around policy development — justification and rationale, working through all the regulatory issues, assisting with setting up the program, and working with our different operational divisions to put in place the customer policies and procedures. The advocates went a long way to enlightening BC Transit about accessibility and the interface with bicycles. It was about accommodating customers. Yes, you can get on the system; yes, you can park your bike here. They were advocating for better bike facilities, in particular where there were obstacles. The biggest obstacles in Vancouver are bridges and water, the tunnel, all of that stuff. So those are the things we addressed first, to try to get more people on bikes. No decision about changing transit service is that easy or simple. The organization was going through tough financial times, and there really wasn't much room to expand its scope of services. It was a provincial organization, and there was a lot of pressure to be very efficient and keep costs down. GVRD Parks and Planning were quite involved in the early days creating bike maps before TransLink was created. They created the first bike maps for the whole region. BC Transit was part of the group, and I used to go to those meetings. I think one of the reasons why some of that work fell into my lap was because I had proven experience with customers, because of all the access transit work I was doing. And then also because I was a cyclist. We met with the Ministry [of Highways, now the Ministry of Transportation and Infrastructure] in Victoria. When the Alex Fraser Bridge was being built, we were adamant that there should be room for cyclists on the bridge, that it should be on the road, and not on the sidewalk. It would have been '82 or '83 — I remember many, many trips over there. We were promised a lane on the bridge. Before it even opened, traffic had increased so much they had to take that away. And we were on the sidewalk. Basically, access was being fought for — crossing bridges, the Burrard Street Bridge, the shoulder of a highway. It seemed to me, to the chagrin, I think, of many people now, that the solution was a little bit better education. While each of the cycling clubs operated in their own silo, with limited focus and resources to allocate to advocacy, there was another organization with more of a bureaucracy, more connections, and in a better position to bring authority to the push for change. The Bicycling Association of BC was (and still is, as Cycling BC) the provincial member-based organization responsible for regulating and organizing sport cycling. 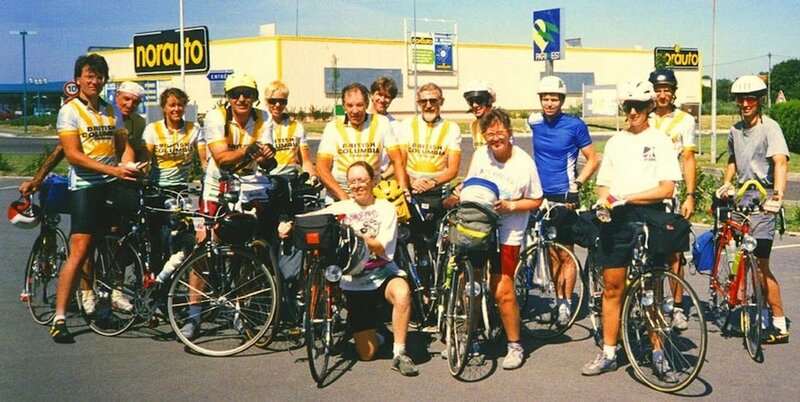 Through the 1980s and into the first half of the 1990s, the Bicycling Association of BC maintained a recreation and transportation advocacy committee, supported by a very limited number of staff and volunteers committed to improving conditions on the ground. I was on the Board of the Bicycling Association of BC initially. They always had a staff administrator, but when that became vacant, it was elevated to an Executive Director. I applied and got that job. I was there from the beginning of '86 to '95. The organization had a mandate for recreational cycling, as well as competitive cycling at that time. As a matter of fact it was pretty well the only game in town. Pretty well all cycling endeavours, organized cycling endeavours, were contained under that umbrella. I was overseeing everything. There was road racing, mountain bike racing, mountain bike trails was coming on-board, and of course recreational cycling and cycling advocacy. I made a point of being involved in all the sectors. I mountain biked, I even raced. But my real love was transportation. It's what I felt the bicycle was best for. I really felt there was a need for an official body that received government grants to also represent the recreational cyclists. But it was always the lesser part, the poor sister. I was trying to find grants for us to work on projects. I used to sit in on meetings, and I'd be the only woman, the only cyclist, in the sea of suits. I was already a member of the organization, and when the gentleman who was the vice president of recreation and transportation at the time had enough and resigned, I said, “Well maybe that's something I can take on.” And I did. I guess I started getting involved in cycling advocacy for a couple of reasons. First of all, working in traffic management and transportation planning, I had some background knowledge of those areas. And my experiences on the road were sometimes negative. Interactions with drivers, and dealing with difficult traffic situations, which complicated cycling, and made cycling difficult for people to even envision. And at that time, the community was there, but it wasn't drawn together. You couldn't say, “Oh we have 250 members, or 2,500 members.” There were definitely 2,500 cyclists out there, but they weren't together. In order to get government to listen to us, we had to have a community. And so there was no voice. We were carving it out. Somehow people thought that we had the whole floor of a building with secretaries typing away all day, and that we had massive manpower and the wherewithal to do all this stuff. We would receive letters: "How come you're not dealing with the laws here in BC about licensing for cyclists?”, and so on. It was not as dramatic as you think. There was some bureaucracy of course, but relatively small. There was an executive director, two people to help out in the office, and Gerry Periera, who came in part-time to take care of racing memberships, and developed a computer program to do it so he could take care of his kids. We were connected to the Randonneurs, the Richmond Bike Club and the Vancouver Bike Club. Literally hundreds and hundreds of meetings over the years. I took time off work, vacation time, as part of my role as Vice President of Recreation and Transportation. I was strongly motivated personally as a daily cyclist, and as a transportation practitioner. I saw how a lot of what was done in terms of providing transportation infrastructure was contrary to properly accommodating cycling as part of that mix. I guess I found myself in somewhat a unique position, having an understanding and being able to talk the language of the transportation practitioners. Disconnected from the efforts of the Bicycling Association of BC and the cycling clubs — but with some slight overlap in membership — was a small group of citizens who had been meeting since the 1970s to provide a community, and a collective voice, for concerns about active transportation equity, facilities, and justice. They wanted local government in Vancouver, and also Richmond, Burnaby and the North Shore, to address the inequities experienced by those using a bicycle for transportation on a daily basis. They knew some of it was the result of gaps or problematic provisions in provincial transportation legislation and policy. And they wrote letters, attended council meeting, and met with the politicians. They called themselves the Bicycle Advisory Committee. It was independent of city hall, but through singular, favourable relationships with sympathetic public officials, they had its ear. There was this unsanctioned bicycle committee, this small core group. And they were seen as the fringe nutters. I'm talking like late seventies — there was some presence at City Hill, but people just thought they were all nutters. Well, they dressed like they were the hipsters. They were like hippies. Big time. They were a small group of relentless advocates, just single-minded. They'd show up and there would be some eye-rolling, a little table-pounding. We made contact with some of them. But it was a little bit more ad hoc, and there wasn't such an organized concerted effort, as there was in the early 90s. Joe Arnaud, a resident of the West End, was involved with the original committee, and I believe he might have been the chair. We spoke occasionally, off-the-record about things. I began to be more involved as staff liaison to the committee, so I attended the meetings. It was maybe Nelson McLaughlin who got me involved. One of the things we worked on was Point Grey Road. Well, that didn't go anywhere. I actually sat on the committee for about three years in Vancouver when I was in Kits. It was supposed to be about three meetings I think, and three years later we were still meeting. Despite the feeling of powerlessness advocates felt at times, transportation planners were not immovable objects, nor were government bodies immutable to change. In particular, the regional transportation authority, BC Transit, was on the cusp of a decade of transformation. BC Transit evolved as an organization, culturally, to become way more responsive to the local customer. And a lot of that had to do with just the governing structure that involved the local mayors, it was called the Vancouver Regional Transit Commission. They held monthly public meetings and there were reports about service plans, budgets, and service issues. It was the venue for advocates to lobby for changes to the service. And the bicycle advocacy people were pretty vocal. One of the biggest things was at Expo. We convinced them to put in tons of bike racks to encourage people to ride their bikes down to Expo, because we didn't want all those cars down there. After Expo they had all these bike racks that they had to get rid of, and they went all over the city. One of the other things was getting bicycle racks on buses. Danelle would throw her weight in there on that. After Skytrain was up, at least twice a year I think, we sent a letter to BC Transit: “You need to allow bicycles on the trains. You have to have lockers, and racks on the buses — this is ridiculous,” and so on. We had the name that carried some weight. So when we sent letters to BC Transit, we had some pull. We would do what we could at the time. I think what happened is someone from the advocacy side approached BC Transit. It might have been Marion; Danelle was involved in those days as well. It could have been anybody. I worked with the Skytrain folks to allow the bicycles to get on the Skytrain system, and all the rules around that. It was a complicated process due to the regulatory environment around trains and escalators. This was happening around the same time as space and procedures for boarding passengers in wheelchairs was being designed . Expo Line was the first door opening to additional focus and thinking about bicycles for the organization. During that timeframe we also started a bike locker program. Racks and the locker program went hand-in-hand, and I worked hard to promote them. Bike racks on buses was quite a struggle. I had to convince the unions that the drivers wouldn't have more work because of it. BC Transit was on my side thankfully, as they saw it as a way to increase ridership. Bike racks on buses were much more common in the US. BC Transit did some research, looked at those systems and said, "Oh, this is how they're handling it." And we looked at how our agency had to do it. It took a while because there were a lot of inter-agency regulatory issues to sort through. The motor vehicle branch regulates the bus configurations and ICBC approves the safety features on buses; there are headlight issues and width and length issues, a certain physicality of it. And the driver and passenger safety factors of course. There was a process to educate the bus drivers, the union, that it would be safe. There was a lot of testing with racks, often with cycling advocates present, in order to develop a protocol for their use. Bus bike racks started out only on those routes where we knew there were physical barriers to bicycles. The Massey Tunnel was one, the Lions Gate Bridge prior to the retrofit was another. After a length of time, BC Transit was convinced that all buses should have bike racks. All of those things came through, because they were able to go to these public meetings to advocate for that.